NEWINGTON - Week by week, the Newington football team has seen improvement. The Indians have now won two consecutive games and their latest, a 24-7 victory over Bristol Eastern, helped them match last season’s win total of three. Newington will be trying to continue that momentum into tonight as the Indians will matchup with Bristol Central (2-3). Although the Rams only have two wins on the season, their record doesn’t reflect how good of a team they really are. Last Friday, Bristol Central’s quarterback Justus Fitzpatrick led the Rams to their second win of the season, a 29-22 feat over previously unbeaten, No. 13 Maloney. Fitzpatrick carried the ball 31 times for 161 yards in his biggest game of the season as quarterback. He also completed 6-of-6 passes, including a 14-yard touchdown toss to wide receiver Nate Rosa, for an additional 57 yards of offense. The Rams used a ball control attack to keep the Spartans under control and will try to do so tonight against the Indians. Fitzpatrick has been a playmaker all season long for Bristol Central, but he’s not alone. Rosa and running back Darrell Payton have also contributed to its success. On the ground Payton had 16 carries for 54 yards last week. The Rams are more effective on the ground than in the air, but Pace isn’t going to just focus on stopping Bristol Central’s run game. Like last Friday, the Indians must come out of the gates firing. Newington has struggled in the past with playing the entire four quarters and last week the Indians finally did it. Now, Pace hopes his team can continue to grow and improve off that performance rather than take steps backwards. “[Central] held a very potent and talented Maloney offense to just a couple scores,” Pace said. “So we know it’s going to be a very good opponent that were seeing and that we make sure we continue to get better, and not to step back. Having a good week or a bad week of practice usually determines how the game will go. From experience, the Indians know what they must do in order to come out with a win. 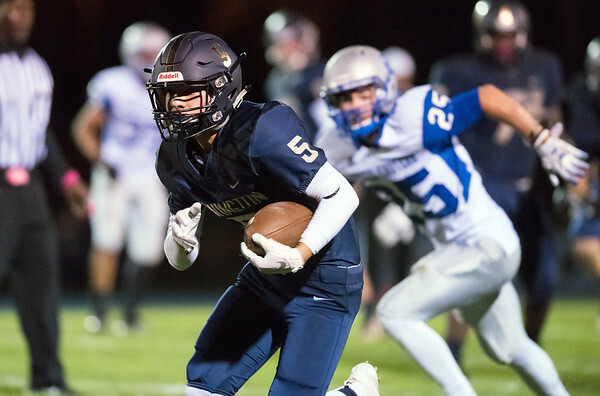 “We have to play every drive like it’s our last and just put 100 percent in every time,” Newington linebacker Zach Demarco said. Posted in Newington Town Crier, Newington on Thursday, 18 October 2018 18:32. Updated: Thursday, 18 October 2018 18:35.